Grants and fellowships are increasingly essential to an academic career, and competition over federal and foundation funding is fiercer than ever. Yet there has hitherto been little training available for this genre of writing. 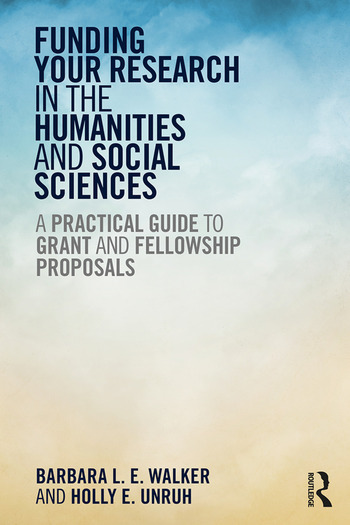 Funding Your Research in the Humanities and Social Sciences demystifies the process of writing winning grant proposals in the humanities and social sciences. Offering practical guidance, step-by-step instructions, and examples of successful proposals, Walker and Unruh outline the best practices to crack the proposal writing code. They reveal the most common peeves of proposal reviewers, and offer advice on how to avoid frequent problem areas in conceptualizing and crafting a research proposal in the humanities and social sciences. Contributions from agency and foundation program officers offer the perspective from the other side of the proposal submission portal, and new research funding trends, including crowdfunding and public scholarship, are also covered. This book is essential reading for all those involved in funding applications. Graduate students, research administrators, early career faculty members, and tenured professors alike will gain new and effective strategies to write successful applications. 14. Failure or Success: What Next? Barbara L. E. Walker is the Director of Research Development for the Social Sciences at the University of California Santa Barbara, USA, where she is also Special Assistant to the Executive Vice Chancellor for Diversity Initiatives. Walker was a founding Board Member of the National Organization of Research Development Professionals (NORDP). Holly E. Unruh is the Associate Director of the Undergraduate Research Opportunities Center at California State University, Monterey Bay, USA. She previously served as the founding Associate Director of the University of California Institute for Research in the Arts, and Associate Director of the University of California Santa Barbara Interdisciplinary Humanities Center.